The grass is always greener where the soil has been properly prepared and the seed has been applied correctly! Soil stabilization and retaining undisturbed groundcover are often your lowest-cost, yet most effective treatments for controlling soil erosion and preventing sedimentation into creeks and ponds. For forestry operations in North Carolina, the statewide regulations Forest Practices Guidelines Related to Water Quality (FPG's) have specific requirements for establishing and/or protecting groundcover. Stop for minute and consider: It only makes sense that if you promptly and effectively stabilize bare soil areas with fresh groundcover vegetation, you will greatly enhance the rehabilitation process on the site. 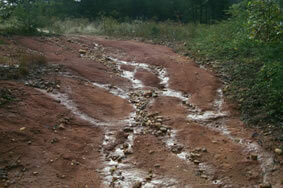 With good soil stabilization, surface water can soak into the soil, rather than run-off and erode the soil. Which would you rather see on your forestland? Stabilized soil with grass and stone. Eroded road surface with no stabilization. To adapt to North Carolina's sometimes harsh soil conditions, you may need to add soil amendments when establishing groundcover vegetation. Soil amendments include lime or fertilizer. Mulching over recently applied seed can retain moisture and promote germination and rooting of the seed crop. 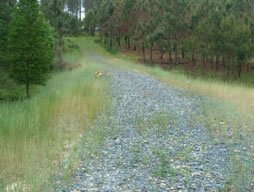 The North Carolina Forestry Best Management Practices Manual to Protect Water Quality contains an entire chapter on site rehabilitation and stabilization, and includes recommendations that can help you keep the soil stabilized, along with a table of suggested seeding options for forestry sites.